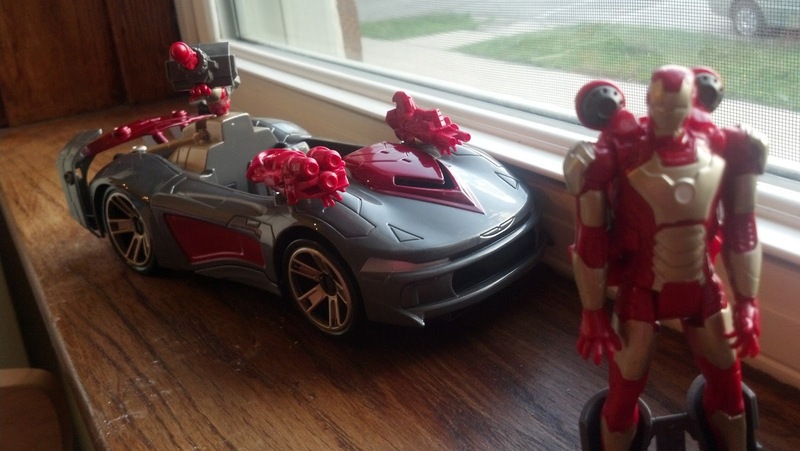 Dad On the Run: Hasbro's Iron Man 3 toys... not just for boys. We were recently provided with a set of 3 toys from the Hasbro Marvel Iron Man 3 collection which arrived in a nifty box from "Stark Industries." To say my daughter was excited would be an understatement. She didn't know they were coming and, as far as I knew, didn't really have any idea about Iron Man. I was wrong. She was shouting "Iron Man, Iron Man! Are those for me!?" by the time I got the toys out of the shipping box. She hovered nearby watching with great interest and poorly contained impatience as I began the work of releasing the toys from their cardboard and plastic prisons. 4 days later, she's still playing with them all. Below is a description and my opinions on each of the toys we received. I'm new to the toy reviewing world, but hope to make it something I can do on occasion. Let me know what you think and how I could improve my reviews if you would. 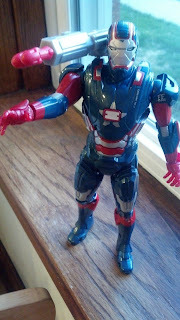 Marvel Iron Man 3 Avengers Initiative Arc Strike Iron Patriot Figure (aka: War Machine) - Ages 4 and up. Requires 3 "AAA" batteries (included). This figure is about 10" tall and comes with a shoulder-attached missile launcher. 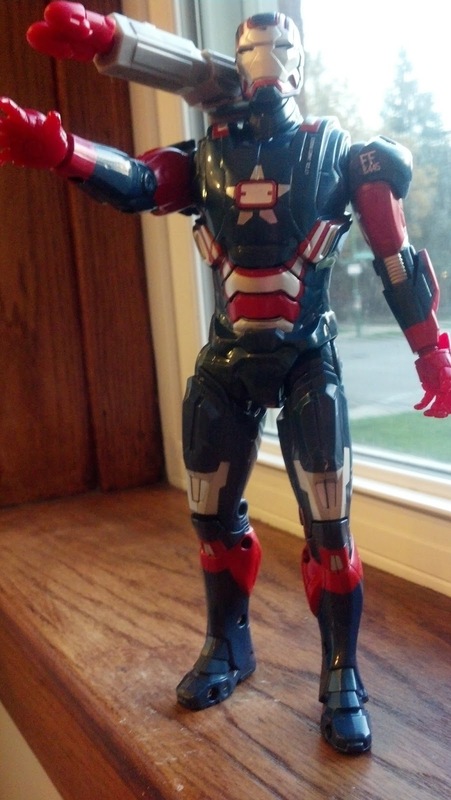 The action figure moves at the neck, arms and legs but there is no movement at the elbows or ankles and only partial movement at the knees. War Machine comes with a flip-up double-barreled missile launcher (actually shoots a small projectile 2-3 feet). When you lift his arm, the launcher pops up, and you push the button to fire the missiles. The figure also sports combat sounds, pulsing lights and battle phrases. Marvel Iron Man 3 Avengers Initiative Assemblers Battle Vehicle - This one is for ages 4 and up. No batteries required. 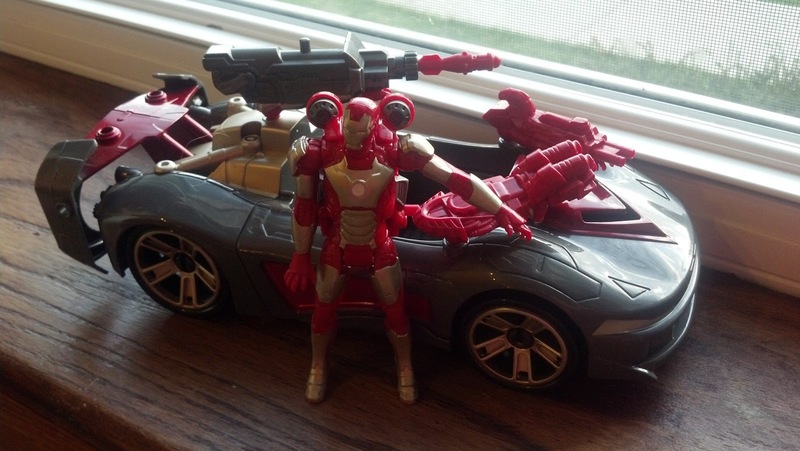 The set includes a flip-up car (think funny car with a spring loaded Iron Man launcher), 1 Iron Man figure, 3 weapon-arm accessories (interchangeable arms for the figure which double as guns for the vehicle), and a figure-launch accessory (I call it Iron Man skates) and instructions. 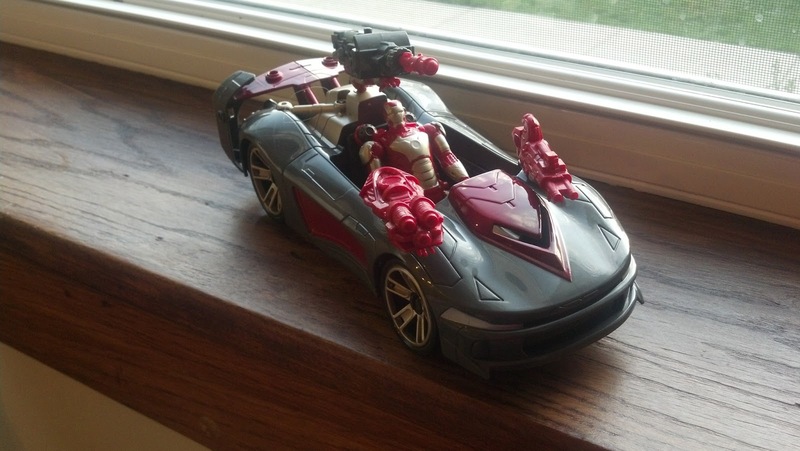 When the "assemblers" size action figure is loaded on his "skates" and into the springloaded cockpit, he can be ejected/launched forward by pressing down on the rear spoiler of the vehicle. If you are on a smooth surface and have the figures arms up, but not quite straight up, he can and occasionally does land on his feet and continue to skate across the surface for a foot or two. More often, if you don't have the arms in the correct position or are not on a perfectly smooth surface he falls on his face, not that this bothered my 4 year old at all. She was too busy launching missiles and changing arms guns around to care. 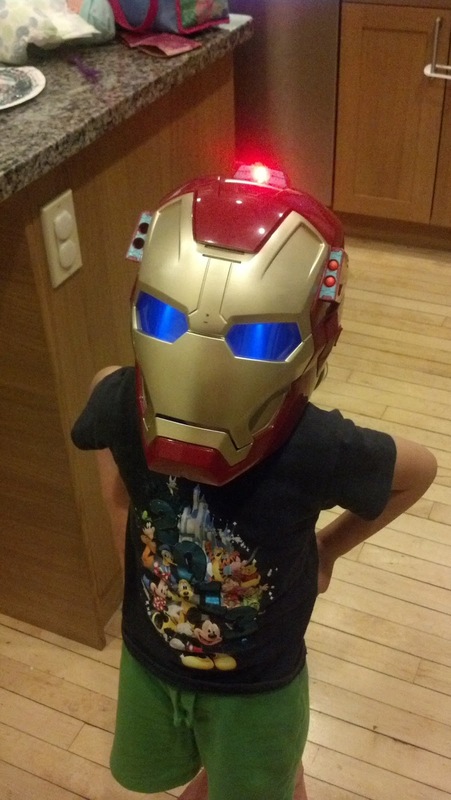 Marvel Iron Man 3 ARC FX Mission Mask - Ages 5 and up (probably due to the projectiles which shoot out with some force, probably good for 6-8 foot "targeting"). The web indicates the mask does not include batteries, but ours came with the 3 needed "AAA" batteries already installed. The mask has buttons on either side of the head for launching the missiles and activating the lights, blast sounds and battle phrases. When you hit the fire button the eyes light up blue giving a nice effect to the wearer and anyone on the receiving end of a missile attack, there is also a red light on top that lights up. This is probably my daughter's favorite toy of the collection. 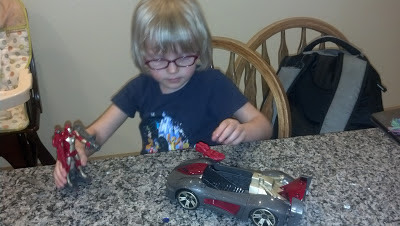 She thoroughly enjoyed taking it to school and intimidating the boys who tried to tell her it was a "boy's toy." How quickly their tunes changed once she activated the sounds, shot a few warning missiles over their heads and chased them with glowing blue eyes. I have also found the mask to be quite efficient for keeping bacon grease from popping into my eyes. 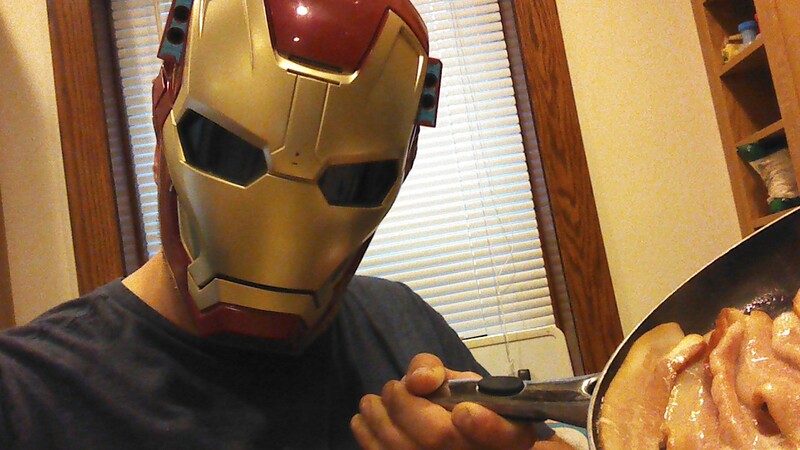 Nothing makes cooking dinner go by faster than pretending to be a battle-suit-wearing superhero. FTC Disclosure: The assortment of Hasbro Marvel Iron Man 3 Toys were provided to me by Hasbro for the purpose of review consideration. All opinions are my own with input from J Bean. I was not compensated otherwise for the review nor was I given any instruction or input by Hasbro on how to present the products (nor would I have listened if I was).